Rockstar has announced that it will be showing off the first gameplay from Red Dead Redemption 2 tomorrow. It doesn’t take a lot to figure out what the hottest game this Christmas period is going to be. A core Rockstar game doesn’t come around every year, but that doesn’t stop games like Grand Theft Auto V topping video game charts even to this day, years after launch. Red Dead Redemption 2 will almost certainly perform similarly, and because of that, any bit of news that comes out about the game is eagerly anticipated. 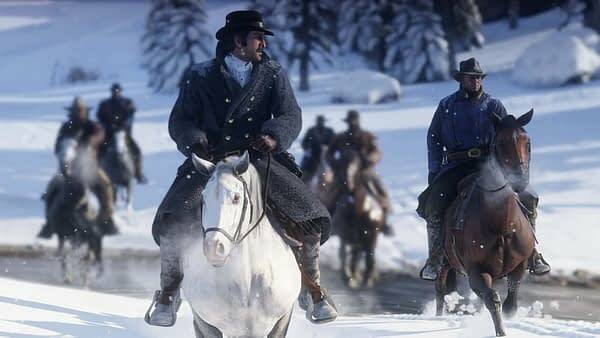 With that in mind, tomorrow is going to be a big day for the game as Rockstar has just announced that tomorrow we will be getting our first glimpse of gameplay. This is what many have wanted to see since the game was announced. The trailer will land on Thursday, August 9th at 11AM Eastern Time, so set your clocks. There is no indication of what the reveal will contain or how long it will be, but it’s clear there is going to be a focus on how the game actually will look and feel for a player. I wouldn’t expect any great story revelations here, but since we don’t know what we will be seeing, it’s not completely out of the question. Here’s hoping that it is somewhat unbroken Red Dead Redemption gameplay, with maybe even the talk-y lady who introduced Grand Theft Auto V videos. I think just about everyone is curious to see how this game will look in the actual moment to moment. We will be here tomorrow to bring it to you when it does launch.